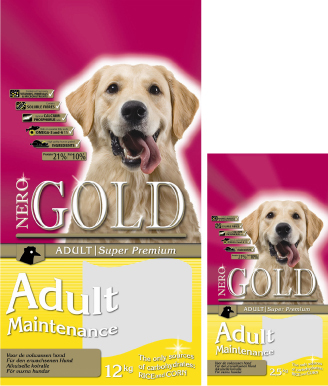 This tasty super premium maintentance food with relatively light composition suits lower activity level pet dogs. For their owners we have adjusted the price at a wallet-friendly level. Ingredients: dehydrated chicken, corn, rice, chicken fat, yeast, beet pulp, carob, minerals & vitamins. Analysis: protein 21,0 %, fat 10,0 %, fibre 3,0 %, ash 5,5 %, moisture 9,0 %, phosphor 0,9 %, calcium 1,25 %. Added: vitamin-A (E672) 15000 IU/kg, vitamin-D3 (E671) 1500 IU/kg, vitamin-E (as dl-alpha-tocoferolacetate) 75 mg/kg, vitamin-C (as l-ascorbic acid phosphate) 100 mg/kg, E1 50 mg/kg, E2 1,5 mg/kg, E3 0,5 mg/kg, E4 5 mg/kg, E5 35 mg/kg, E6 65 mg/kg.